Louisa Clark – “Lou” to her friends and family – is twenty-seven and going nowhere fast. She still lives with her parents in their cramped little house, along with her grandfather, her brilliant younger sister and nephew. Lou has just lost her comfortable job at the cafe where she’s worked for the last seven years. Her family depends on her meager income to help make ends meet. After a string of temp jobs, Lou grudgingly accepts a six-month contract to work as a companion/caregiver for a quadriplegic. Will Traynor has lived a big, adventurous, ambitious life. He’s traveled all over the world, climbed mountains, jumped out of planes, and made a fortune in the cutthroat industry of business acquisitions. At thirty-three, his life takes a devastating turn when he is crossing a street and is hit by a motorcycle. Permanently paralyzed from the chest down, he is wheelchair bound and requires round-the-clock care. Stripped of his ability to feed himself, dress himself, or even make the most mundane of choices for himself, and plagued by repeated infections and health problems related to his condition, Will does not see any point in going on with his life. When Will’s and Lou’s lives intersect, they are both changed in profound ways. The genesis of their relationship is full of tension and resentment, and Lou has serious misgivings about being able to fulfill the six-month contract she agreed to with this angry charge who hurls abuse at her. Before long, however, her father loses his job, and she is the sole breadwinner supporting a family of six, so quitting is out of the question. Over time, Lou and Will become more comfortable with one another, and a friendship develops. When Lou learns by accident of Will’s ultimate plan and why she was hired on a six-month contract, she becomes determined to turn things around for Will. In her quest to save Will, Will saves her. This is a love story. I’m not particularly a fan of love stories – or, I guess more accurately, of romance novels – but this story shook me. This is not a story of bodice-ripping damsels in distress, or muscular, square-jawed men who come to the rescue. This is a deep and profound story about love and loss, about living on one’s own terms, about finding untapped inner strength, and about loving another person enough to let go. 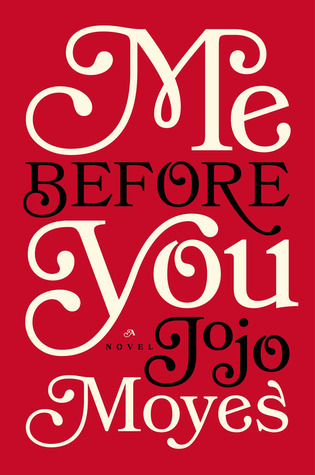 Me Before You forces the reader to explore some uncomfortable questions about living and dying, about who gets to decide if a life is worth living. Moyes has brilliantly cast a quadriplegic man who feels he has nothing to live for as a hero, and the relationship that develops between Lou and Will is so natural, so believable, you would almost think that the author is pulling from personal experience (she’s not). Although the subject matter is heavy, the story is not morbid, and there are plenty of laugh-out-loud moments. Read it. It’s excellent. And have a box of tissues handy. I know I won’t get this story out of my head for a while. Mom to seven, avid reader; my sixth child, Finn, has Down syndrome, and that's led me to some very interesting reading. Read with me! Then, let's discuss. Supporting Positive Behavior in Children and Teens with Down Syndrome by David Stein, Psy.D.